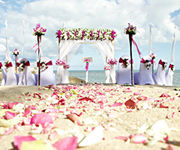 Planning a wedding in Thailand has never been easier, than with the assistance of Signature Weddings. 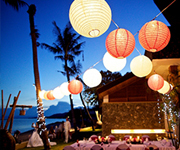 The stunning array of villas available for weddings in both Koh Samui and Phuket, are situated in breathtaking locations, with endless views, tantalizing turquoise waters and icing sugar sand all setting the perfect wedding scene. Choosing to have a wedding abroad, is a big step and with Signature Weddings we will create with you, a wedding in a villa of your choice, that will be mouth droppingly gorgeous and surpass all of your wedding expectations in beauty and style. Emanating nothing but utter wedding wow factor! Each detail, from menus to table designs, colour palettes to flowers, photographer's to the wedding album lay out, will be fine tuned. Whether you would prefer a DJ that understands your preferred music, or a live band to kick off the first dance, with dancers and fireworks that light up the night sky. Signature Weddings can assist you in fulfilling your exact wedding day desires, so together with the wedding planner, your day will truly be something out of the ordinary. Signature Weddings also understands that although of course this day is about the bride and groom, it is also about the family and friends that have traveled from near and far to be here on this incredibly special day. 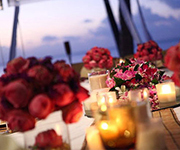 With this in mind, Signature Weddings can organize a host of events for the wedding party as part of the wedding package, so that everyone can thoroughly enjoy the island and all it has to offer, on the lead up to the wedding day. A day on a sport cruiser visiting breathtaking tropical islands, exploring secluded bays, snorkeling off of stunning coral reefs with a mouthwatering picnic of your choice prepared for you on a deserted beach, is a fantastic way for the wedding party to unwind and lock in together. Or perhaps more adrenalin charged pursuits are in order, a private charter on a stunning speedboat packed with water sport fun from water skiing to wake boarding and jet skiing. Perhaps a group dive with an experienced dive master for a journey of discovery of the island´s underwater life. Be it fun in the sun or kicked back chilled spa pampering, Signature Weddings can organise it all for you. Quite simply, we will do whatever it takes to ensure you all, have the most incredible wedding day and holiday, filled with once in a lifetime experiences that make this wedding a one in a million.